Marmot Chelsea Coat. Distinct, urban-chic lines and minute details camouflage the serious technical prowess of the waterproof, insulated Women's Chelsea Coat. 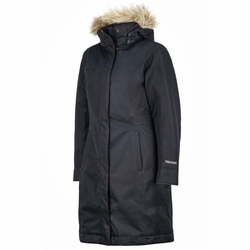 Sized specifically for women, this full-length coat starts with Marmot MemBrain, is stuffed with 700-fill-power goose down, and features a zip-off hood with a removable fur ruff plus zippered handwarmer pockets. 4'11"-5'2" 5'2"-5'6" 5'6"-5'10" 5'10"-6'2" 6'2"-6'6"
Marmot does not recommend dry cleaning for any of our products. Gore-Tex fabric products, MemBrain fabric products, down insulated products, and fleece are all machine washable. You should use a commercial front loading machine and follow the care instructions.